Under the massive tax overhaul passed by Congress earlier this week, many Montanans will see more money in their paychecks because of tax cuts. But some worry those same families will see expenses rise elsewhere, offsetting the savings. The reductions for individuals and families also expire in 2025, unless a future Congress preserves them, meaning many could pay more after that point. Progressives have deep concerns over the inequity of the cuts — and numbers from the state Department of Revenue show the cuts are much bigger the more a person or family makes. Conservatives point out the middle class will see a large portion of the reductions, that more money in the pockets of Montanans is always a good thing, and that it’s fair for people to benefit based on the amount they pay into the system. The average Montana income is $48,380, according to the U.S. Census bureau. According to a report Friday from the Montana Department of Revenue with preliminary estimates, people in that income range can expect to see a tax cut of about $1,019. Estimated tax cuts drop off precipitously for lower-income earners. Those who make from $20,191-$27,612 can expect a $660 cut. Higher-income earners can expect much higher tax cuts — those who earn from $85,154-$119,200 can expect to see a tax cut of $2,177. The estimates from the Department of Revenue are based on income taxes filed by Montanans in 2016 and adjusted for all of the changes in the new tax law. That means it accounts for things like the child income tax credit and state and local income tax deductions. Mike Kadas, director of the department, emphasized the estimate is based on a preliminary understanding of a 500-page bill that affects thousands of pages of tax code and can’t account for different choices people will make based on changes such as a nearly doubling of the standard deduction. Kadas said he would expect withholdings to be adjusted quickly, meaning Montanans expecting tax cuts would notice them in their paychecks soon. Kadas said some of the biggest changes expected are tied to new deductions for pass-through entities, where profits pass to the owner and are taxed at an individual taxpayer rates. Montana Sen. Steve Daines, a Republican, said he initially would not vote for the tax bill until it included a 23 percent deduction on pass-through income. Daines and fellow Republican Rep. Greg Gianforte voted for the bill, while Democrat Sen. Jon Tester voted against it. “That one affects mostly people in the upper income groups,” Kadas said of the pass-through income. He said he expects that to include people earning from $119,201 and up. The near doubling of the standard deduction, from $6,500 to $12,000 for single filers and from $13,000 to $24,000 for joint filers, will have a large impact on those at a lower income levels. That includes people earning from $36,458 and down. According to IRS data from the 2014 tax year, just 28 percent of Montanans itemized on their tax returns. The cap on state and local income tax deductibility — expected to ding people in high-income, high-tax states — will also play a role in Montana, Kadas said. Those who itemize will now have a cap on what they can deduct in state income and property taxes of $10,000. Kadas estimated that would affect the upper-middle class more than those at the highest income levels. About 47 percent of the amount of total amount of tax cuts will go to those earning about $120,000 a year and up. About 14 percent of the cuts will to go people who make between $36,500-$64,000. Just shy of 10 percent of the cuts to to those earning $27,600 and less. Brent Mead, with the conservative-leaning Montana Policy Institute, said that seeming disparity doesn’t represent an inequity problem. Heather O’Loughlin, with the progressive-leaning Montana Budget and Policy Center, said she was concerned that the bill has more benefits for higher earners. “I think there’s certainly those who are going to benefit up front and those who are going to benefit tremendously from this bill. Those who are in very high income (brackets) are going to see pretty significant tax cuts right away,” O’Loughlin said. The Republicans in Montana’s congressional delegation have touted the increase in the child tax credit and a change to make more of it refundable, but O’Loughlin said that’s one thing that could disproportionately benefit those who earn more. The tax credit is based off income level and number of dependents. For low-income families that don’t have tax liabilities but file taxes, the credit works more as a payment than a tax liability reduction. 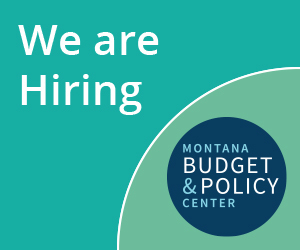 The Budget and Policy Center has modeled that a single parent with two children working full-time at minimum wage would only see the credit increase about $75. The bill also makes the tax credit apply for individuals that make $200,000, or $400,000 for joint filers, increased from the current $75,000 and $110,000 respectively. It estimates about 31,000 children from families that earn less than $15,000 a year will see very minimal increases. Mead argued that a tax reduction is still a tax reduction and again pointed out it’s based on what a person or family pays into the system. “I don’t see how people can think that is a bad thing for low-income families,” Mead said. He added the child tax credit being made refundable is a “huge boost” for families that have have more children, even if parents earn the same income, when looking at the overall tax cut. Though a majority of Montanans are expected to see some sort of tax cut, it doesn’t factor in other components of the bill that will increase costs for those individuals and families, O’Laughlin said. That includes provisions such as the repeal of the individual mandate for having health insurance. The Congressional Budget Office has estimated the change will mean 13 million fewer people insured by 2027 and insurance premiums for the non-group market would increase by 10 percent. Mead said he doesn’t think the repeal of the individual mandate is going to have a huge affect on the uninsured rate. For him, the payoffs for those at the lower end of the income spectrum are worth it. “For those people who don’t have insurance and choose to pay the tax, they were overwhelming at the lower end of the income spectrum,” Mead said, saying about 40 percent of Montanans who paid the tax earned less than $25,00 a year. O’Loughlin said one of her bigger worries are tied to but not explicitly included in the tax bill. O’Loughlin acknowledge no one knows how hypothetical cuts would play out, but said that given that the tax bill adds an estimated $1.5 trillion to the federal debt, it’s possible spending could be reused for Medicaid, Medicare, Social Security and other programs. “The ramifications of passing a bill that increases the deficit to this level is going to put further pressure on Congress to start making other cuts,” she said. “It’s not directly in this bill, but I think Republican leaders haven't been shy about saying the next step is to make some serious cuts. ... That’s incredibly important for a state like Montana, which disproportionately receives more federal funding than we put in. Highway dollars, Medicaid dollars, 42 percent of our state budget is federal dollars,” she said. Mead said he doesn’t think cuts will be as severe as some worry.